Product Listing Ads (PLA’s) were a great idea by Google. They helped focus on products for users looking to make an online purchase, provided apples to apples product comparisons (in many cases), and offered more transparency for online stores. The problem was, it wasn’t executed all that well. Managing PLA’s has been a bit of a headache the past several months. Problems getting access to Merchant Center. Client-Manager permission issues. Feed management and upload issues. Properly setting up granular campaigns. None of it seemed to be working right. But it’s been getting better. And this new update let’s us make on-the-fly changes much more effectively and segment campaigns nicely without having to completely rework feeds (which often take multiple days to process) in order to accomplish our strategies. For more information on Product Listing Ads work, you can view Sydney’s PLA setup & strategy blog here. That’s usually how new product roll-outs from Google work, though. Offer them, then improve from there. And with those improvements (the above seem to be working more effectively as well), Google Adwords has introduced advanced Shopping settings to help create more granular campaigns. Their default setting is still to simply use all products and let their engine do as it pleases, but as we know as Adwords managers, that usually isn’t the best way to go about managing client campaigns. And thankfully that’s the case, otherwise why would they need us? Pretty straight-forward right? Actually, these filtering options don’t provide Google Adwords managers with any increased functionality. They simply make it a little easier to present and manage. In some cases, quite a bit faster and easier. Rather than combing through your products and creating separate data feeds using some excel trickery to segment, Google Adwords will take care of that for you. As long as your data feed variables are intelligently named, you’ll be able to filter at a campaign level before breaking things down by product and ad group. Let’s go through what the filters are and how you can use them. For the sake of an example, let’s assume you’re running an “online gift shop” that contains all those common things you see in gift shops at tourist destinations. This is custom defined by the merchant to do your own internal organization. There’s nothing universal here, and it likely depends on the selection and variety of the products available at your store. Break down products into several main categories. By filtering for a certain product, you can make sure it’s featured when users search for a certain keyword. All of the products will necessarily fall into one of these categories. In our example, we need to categorize the items inside our souvenir shops. Postcards, Miniature Models, Clothing (you could break this down an little more if you wanted), Magnets, Glassware, Keychains, etc. Let’s say you carry a lot of souvenirs based on city, and you’ve found that when people search for them they prefer to buy t-shirts (not magents or keychains). You can force Google Shopping to display only the product types you specific. This means removing the less effective magent and keychain products from the pool and focusing on the products you do want. With the filtering option, you can do this quickly and easily, rather than completely redoing your data feed whenever you want to run a test. The brand variable is the manufacturer of the product. Most useful when you’re selling a lot of varieties of a certain product type, or if you are selling products where users search specifically for a certain brand name. It would also allow you to focus on selling a certain brand name if you wanted to get rid of inventory. For example, if you are overstocked in Under Armor sweatshirts, you could change your add a filter to your “Sweatshirt” PLA campaign to only display Brand=Under Armor so all your ads will feature the Under Armor brand goods, rather than the competing brands that you often have in stock. To be honest, I don’t know what brands a lot of these things are, but it should be pretty straight-forward. Let’s say the postcards are made by Hallmark. Hallmark would be your brand. Whoever manufactures each item in your gift shop, that’s who you want to list here. This is a little more interesting if you’re selling a larger variety of a certain product type. So if you’re “Product Type” is shoes, you’d then be able to segment by brands such as Nike, Adidas, New Balance, etc. Product Groupings is essentially how this kind of optimization was done before. It’s a little difficult to explain briefly, thus why Google has likely made this improvement, but if you’d like to read up on how these work you can view Google’s guide here. Think of it as accomplishing what you’re doing here in a less user-friendly, more confusing way. Of course, if you’d like to nest conditions even more, you can create custom groups, then custom campaigns to filter in those custom groups. Custom groups will remain powerful because they can be used within ad group product targets, whereas this new feature filters purely at a campaign level (for now). It also allows for more flexible management since you can actively change groupings while allowing the campaign to then just filter the groups independently. We could create product grouping based on tourist destination. This would provide a valuable subset of our products for use in further filtering. If we had a grouping called “France”, it would allow us to skip a filtering step when setting up the campaign filters. This specifies whether the product is new, used, or refurbished. That’s all you get. Obviously helpful if you’re running a second-hand goods store. Maybe you’re selling new and used video games, but certain games you don’t want to advertise the used items for. Simply filter them out and you’ll only be displaying new items. We’re not selling any second-hand goods, so everything in our catalog would be categorized as “new”. Now you can start having a little fun. Labels basically means “do whatever you want.” Which is what we like. More options are a good thing. Each product can have up to 5 labels assigned to it, and there is a limit of 1000 unique values to each custom label. That should be plenty to work with, though. Google uses examples such as “high margin”, “low margin”, and “best seller” as possible labels to use. Those are all great. Either filter out low margin items, or just filter in high margin items depending on your campaign goals. “Best Seller” could be a shifting label based on sales (or if you’re selling books or movies, you can reassign this based on what is popular in the market). Another idea for custom labels would be based on a popular time of the year these items are sold. If you’re running an online gift store, you could assign certain holidays to a custom label. You could run an “In Season” campaign where you change the filter based on time of the year (February you would filter in Valentine’s Day, March St. Patrick’s Day, April Easter, etc – changing filters when appropriate). You could even assign seasons (Spring, Summer) or months (January, February) depending on the seasonality of your products and how much you really want to break things down. I could write an entire blog post about how using custom labels will make managing Shopping campaigns much easier, but I think that’s a good introduction to show you the potential there. In our example, we’d probably want to use the location of the tourist attraction as a custom label. So Attraction=New York City or Attraction=Paris. This would allow you to create custom campaigns for each tourist destination. You can also use the more general labels discussed above, or filter out products that you don’t want to target. Let’s say we want to come up with some conditions to feature products to sell for St Patrick’s Day. 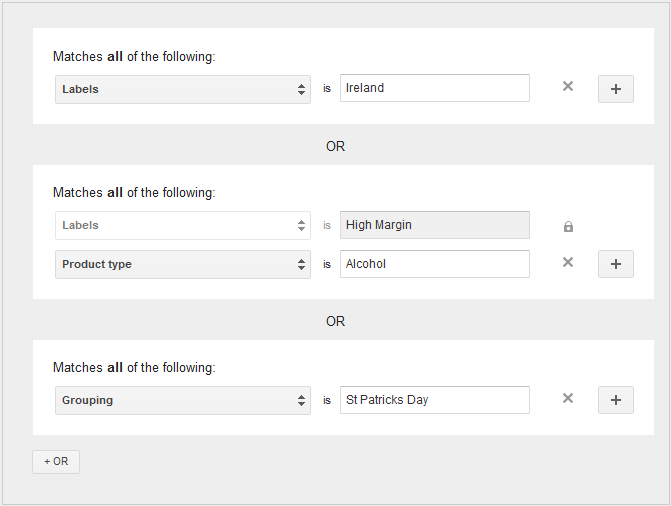 If we label products as “Ireland” (assuming we have country labels) OR “St Patricks Day” (let’s say we have holiday labels) OR due to the nature of St Patrick’s Day (in the United States at least), our “High Margin” products grouped as “Alcohol” accessories, which are a popular gift. Just a hint, if you’re using the “and” qualifier, make sure you put the most permanent options at the top. Each level locks when you add a new one, so you’ll need to clear everything out and add it again if you need to edit your first condition. This makes it much easier to do an OK job with product listings too (for the average user). It improves product organization for the average user, allowing them to segment mainly by product types (if they sell several different category types) and brands (if a reseller). In the least, that should improve store owners’ ability to analyze data, even if they’re using the “all products” settings inside of those custom filtered segments. However, on more advanced level we can use these to simplify our organization and optimization process as well. One important fact to keep in mind is that this is done at the campaign level. If you want to filter a lot of different campaign groupings using these matching options, you’ll have to create a separate PLA campaign for each variation. I would consider this a very successful update for Adwords. It makes the system more functional for inexperienced users, while providing experienced account managers more tools to make data more granular and provide better results for clients.